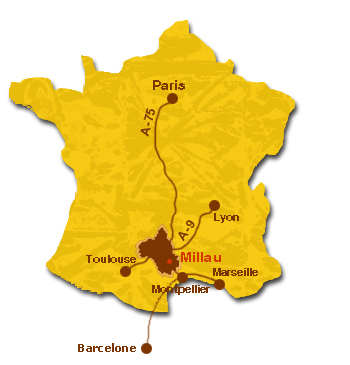 Hotel based, selfguided cycling tours in South of France. Bike tours in Provence, Dordogne Valley, Grands Causses, Corsica and Cathar country. Selfguided cycling or walking holiday trips with detailed route notes and bags transfer. Small typical country hotels with character and charm. From ** and *** small family run hotels to *** and **** luxury hotels. Rooms with shower and bathroom en suite in all packages. The excellent service of a local touroperator. Flexible: Choice of accommodation, length and level of trip. Accommodation: budget, standard, plus, superior and luxury packages. Tailored packages for the same price as our standard tours. Last minute bookings: Leaving within a week? No problem! E-booking and direct selling rates. Cycling in Grands Causses Aveyron..
Our home-base in France: The Grands Causses Nature Park in Aveyron: Tarn Valley, the Gorges du Tarn, Pays de Roquefort. 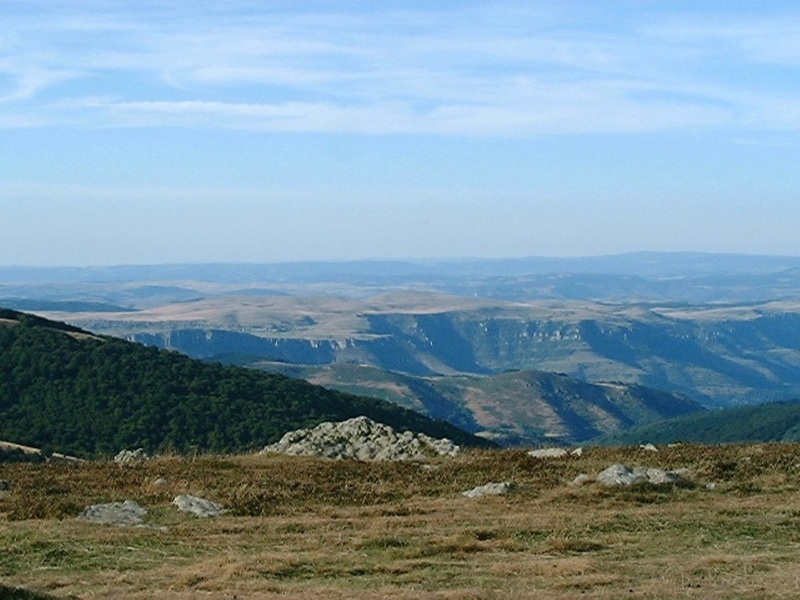 A virtual visit here of Aveyron & Grands Causses. 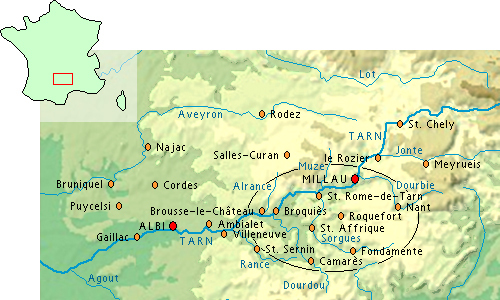 Grands Causses, Gorges de Tarn, Provence & Dordogne. La Ligne Verte is a local, family operated company dedicated to a personalized and customized approach of activity tourism since 199 2 in Southern France. 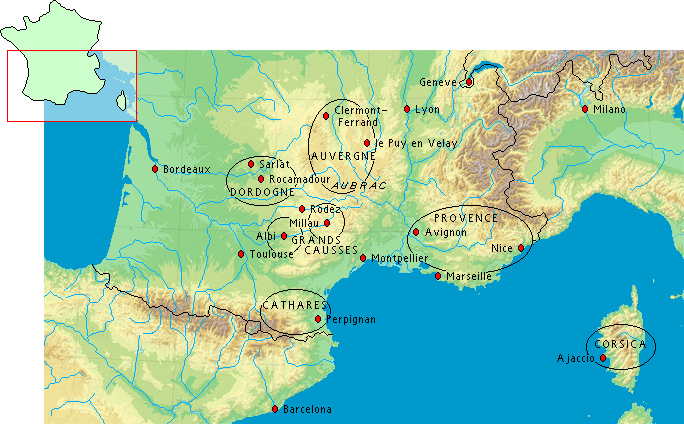 We're on the spot all year and work exclusively in the South of France, which by now we have come to know very well. As locals, we know every site, every back-road, every detail that will make a big difference between the standard tours proposed by some international touroperators and our local, personalized and customized tours. We will help you to discover wonderful remote places and savour the essence of the hidden treasures and the highly preserved local cultures. Tours are really splendid and guarantee an unique experience. We are a small organization not working on an allotment base and so we can receive you in small, characteristic hotels in remote places which only locals come to know. Years of cooperation with local suppliers, hotel keepers, taxi drivers, local Offices de Tourisme (Comit?D?artemental de Tourisme (CDT) de l?Aveyron) and designers and with the maintenance workers of walking trails resulted in our Southern France network. As direct seller and E-touroperator, working with the same hotels as British and American tour operators operating in the same area as we do, we can quote competitive rates and still have an outstanding personalized service. Especially for parties of 3 and more persons we have rather attractive small group discounts. We don't have brochures to send to you and no extensive back-offices, but we are on the spot, all year to give assistance when needed. We communicate mainly by this website and by email, but we can also skype, phone or fax you, if you prefer. If you need more info than this website provides or if you want tailored information we will send it to you by email. Our service and flexibility are the very best you can get. We love travel and adventure but we also love perfect organization : every detail is checked, every thing is done so that all works out for the best. 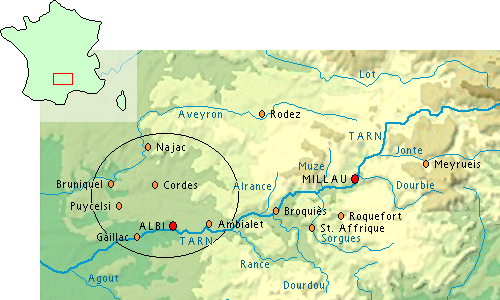 This part of France is big enough for a great holiday. We are small enough to stay in touch with you. For all holidays makers in excellent physical condition, regularly training to be able to bike up to 7 hours a day. These tours are meant for the 20 to 60 years old for whom cycling is the primary aim of their vacation, whilst being able to enjoy the beauty of this country with its fantastic views. Lots of longer ascents and descents in middle range mountains. Several climbs a day of more than 300m and sometimes more than 600m should be no problem for them. Daily distances from 60 to 90 km a day. More longish climbs (5 - 9km, up to 500m elevation gain). Itineraries between 350 and 1000 meters altitude except for the Mont Ventoux and the Mont Aigoual "hors cat?orie". Levels 2 , 3, 4 and occasionally 5 (out of 7). For a description of levels: Click here. Days: every night an other hotel; you can book extra nights in any of the hotels. With La Ligne Verte you will get the commitment and service of a local, owner operated, tour operator. A direct seller, working primarily with local, family run hotels (from 4 to 30 rooms category *, ** and *** ) to ensure you get an attractive, cycling or walking hiking holiday, the French way of life and "Vacances ?la Carte" on beautiful hiking and walking trails or the enjoyable roads for your biking holiday trip. You'll benefit from our network we built the last 10 years, from our direct selling rates and above all from our personalized and customized tours without any extra charges: WYS=WYG: no hidden prices, supplements, reservation costs etc. Individual, Walking, Cycling, Inn to Inn Hiking and Biking Hotel Tours, French vacation in Southern France.